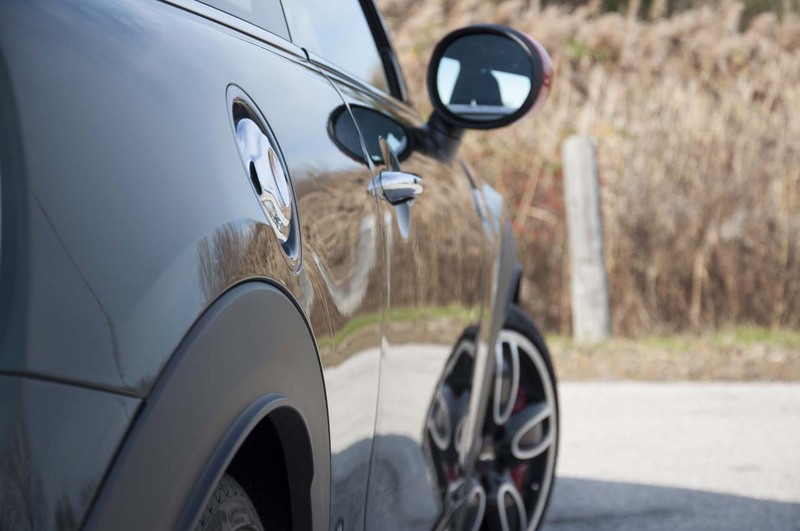 When buying a car, the deciding factors are usually based on logical requirements against which you evaluate each contender and finally come up with a winner. 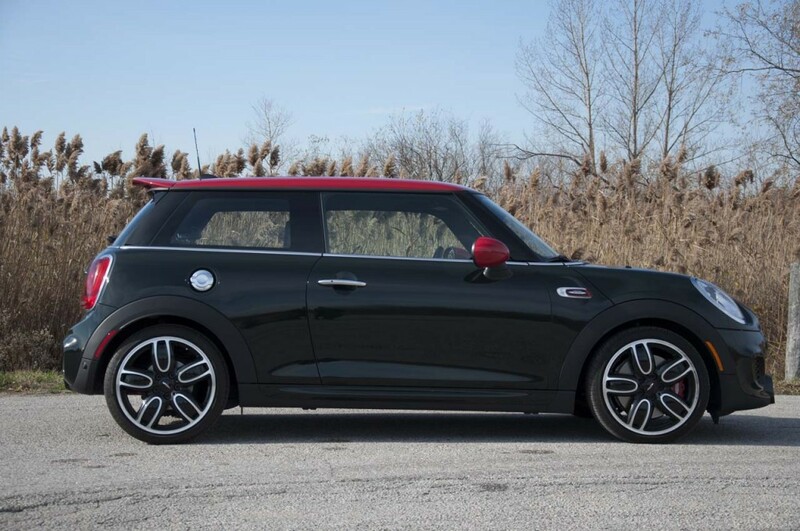 In such a battle, a Mini would probably never win, making it an absolutely emotional and biased purchase. 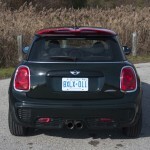 And that is exactly why everyone who went ahead and bought one absolutely loves it! 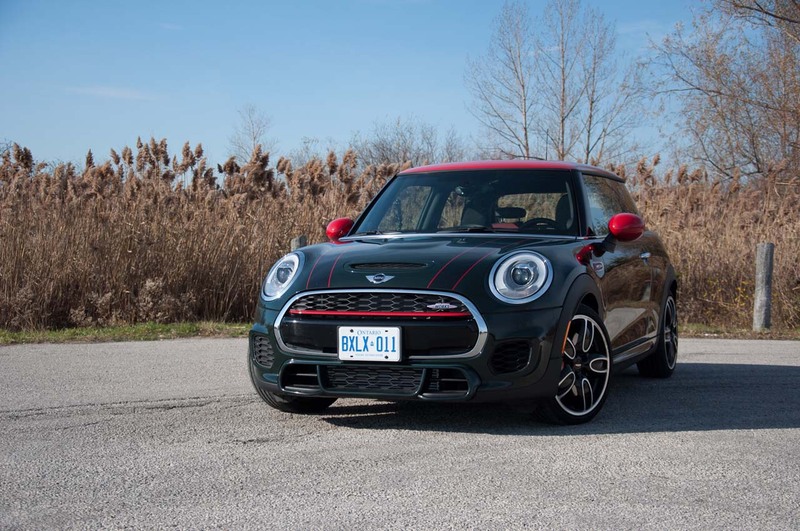 What you probably don’t know about Mini Coopers is that the first model built each time is the John Cooper Works; the best one they can make. 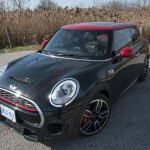 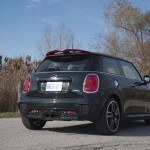 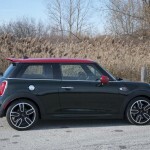 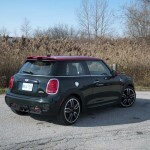 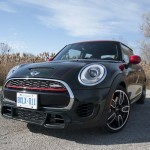 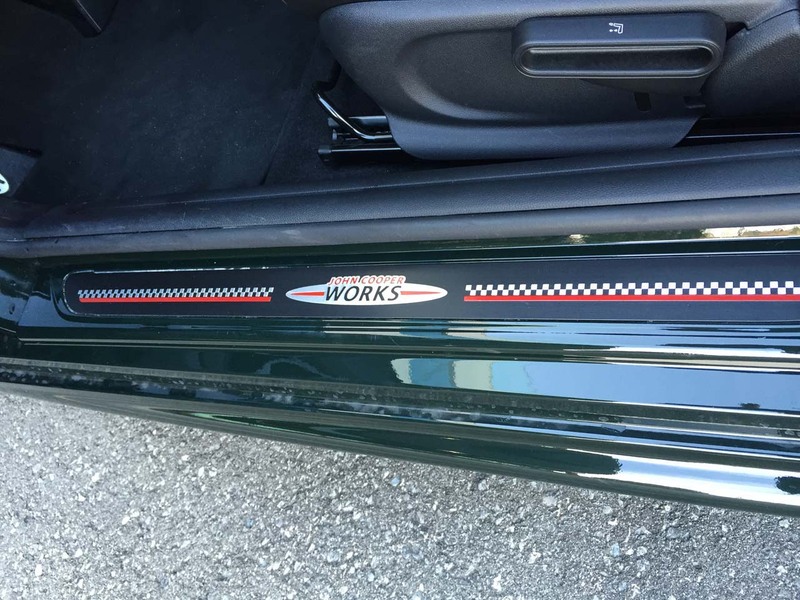 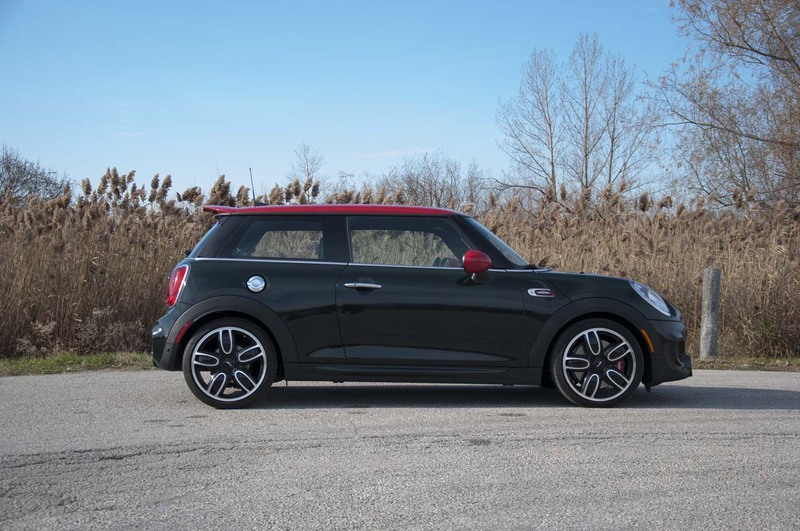 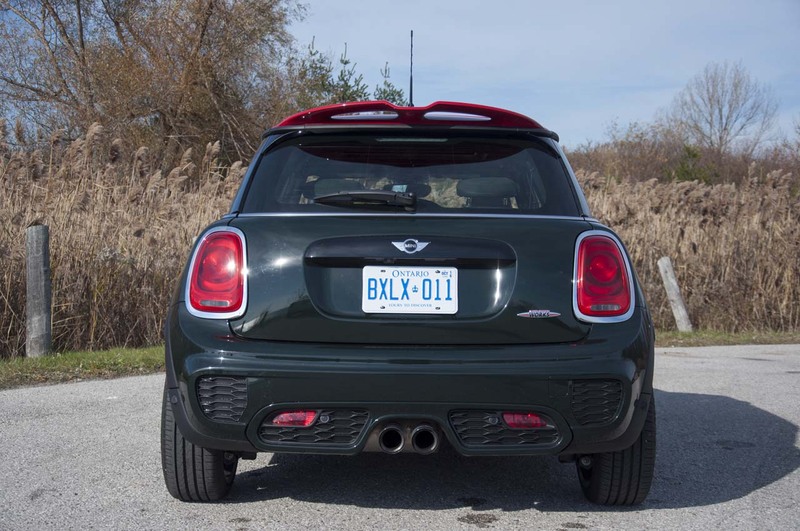 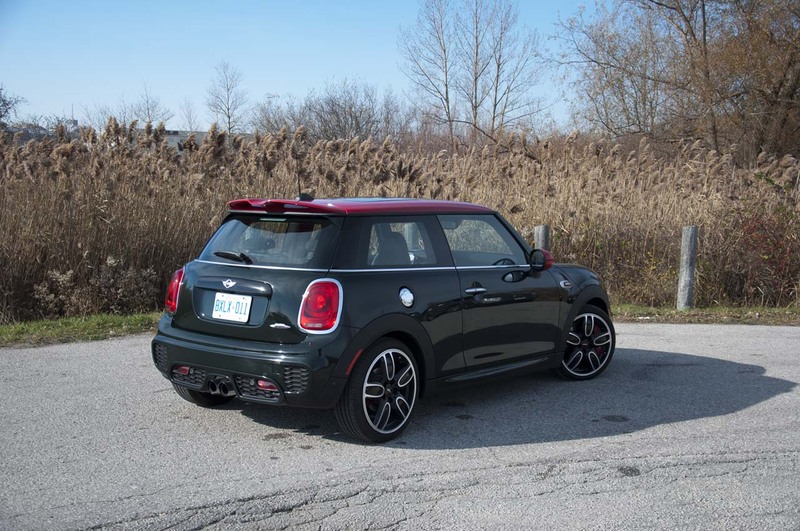 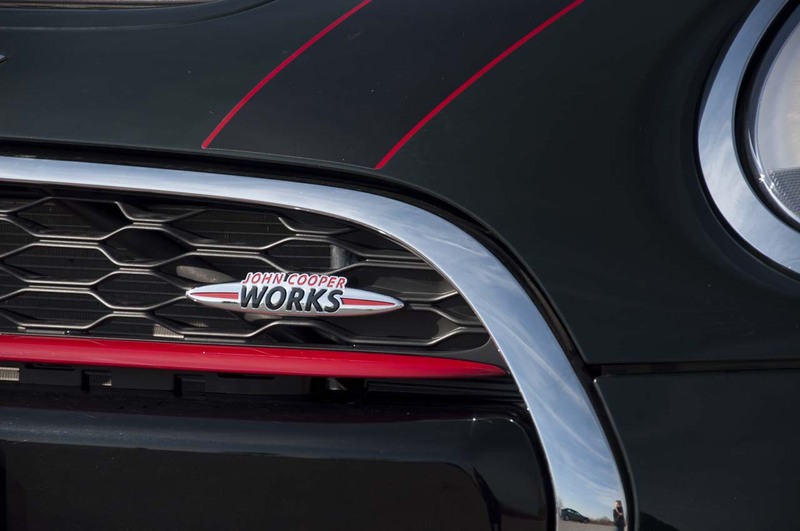 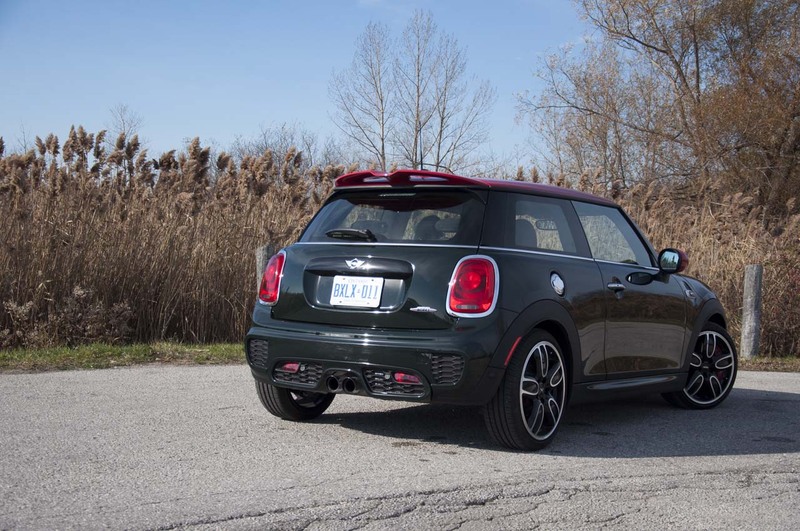 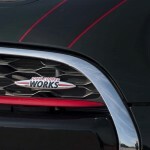 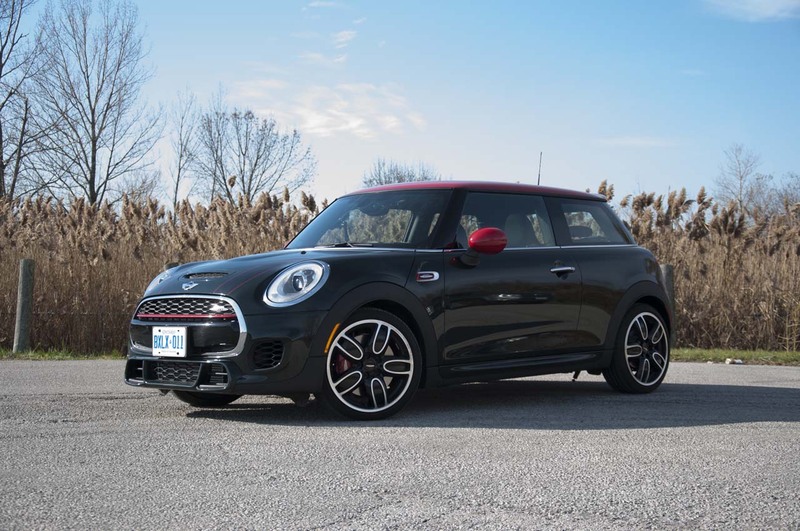 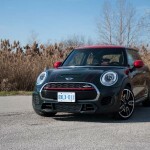 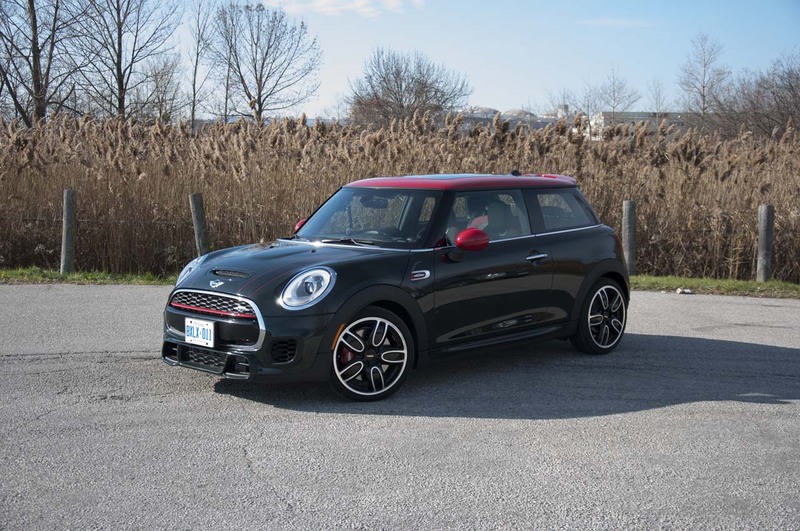 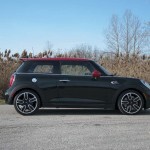 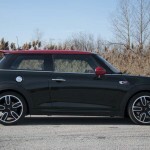 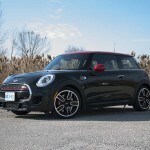 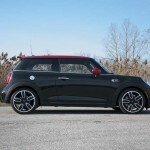 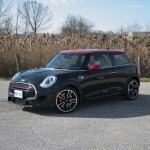 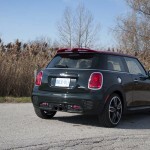 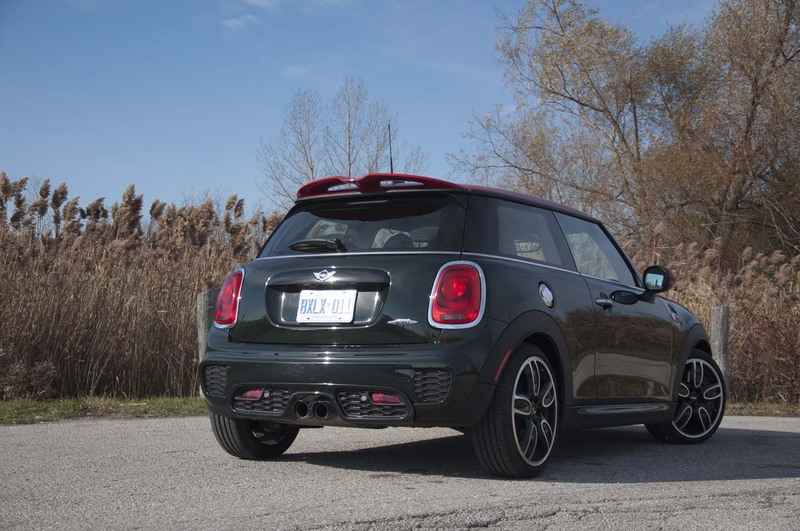 They then go ahead and start stripping it down, creating the Cooper S, the Cooper, the One… So having the 2016 Mini John Cooper Works in hand has created nothing less than great expectations. 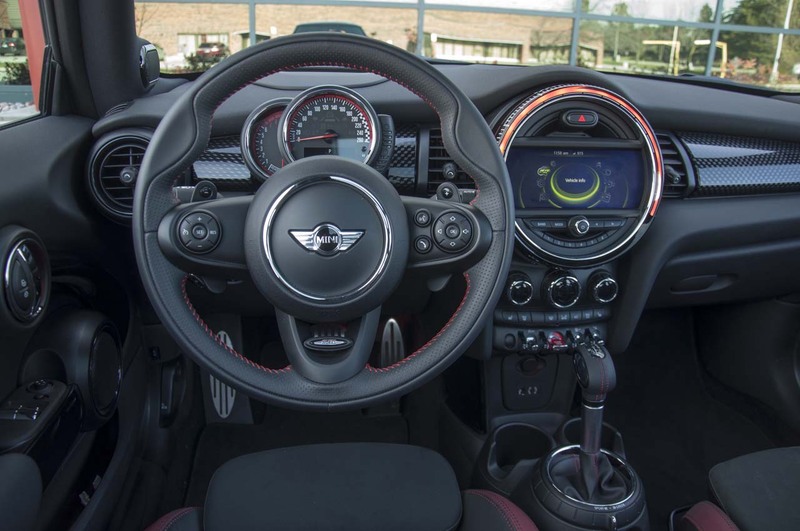 The John Cooper Works, or JCW for short, is an absolutely amazing car; it is so much fun, it can put a smile on your face while listening to Kanye West on the radio. 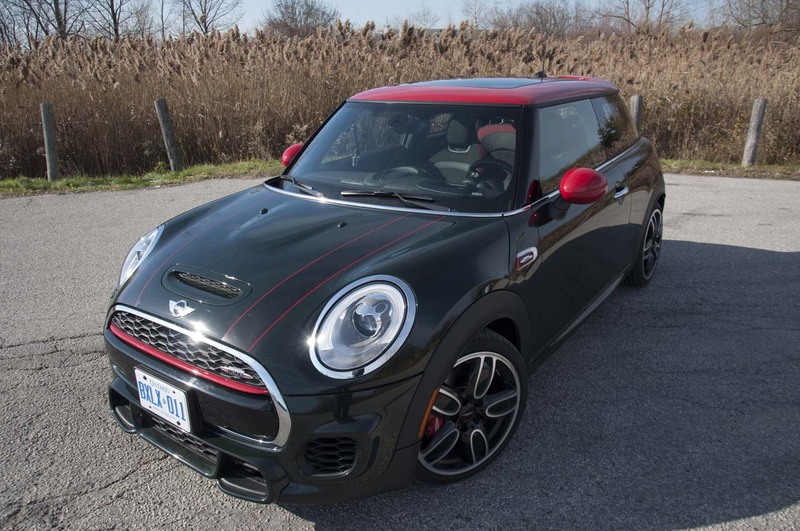 It is really cute, perhaps too cute for some people, and with the racing stripes, red mirrors and roof, huge Brembo brakes that barely fit inside those stylish rims, there is no one able to resist this temptation. 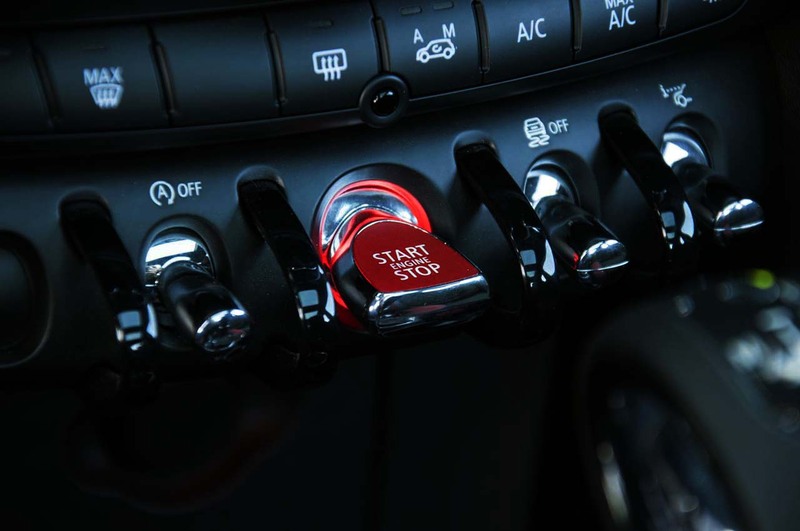 Honestly, if Adam ever had the opportunity to get back to Eve, he’d probably throw one of these her way. 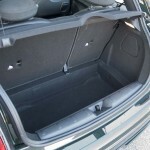 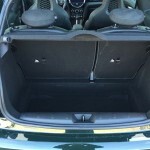 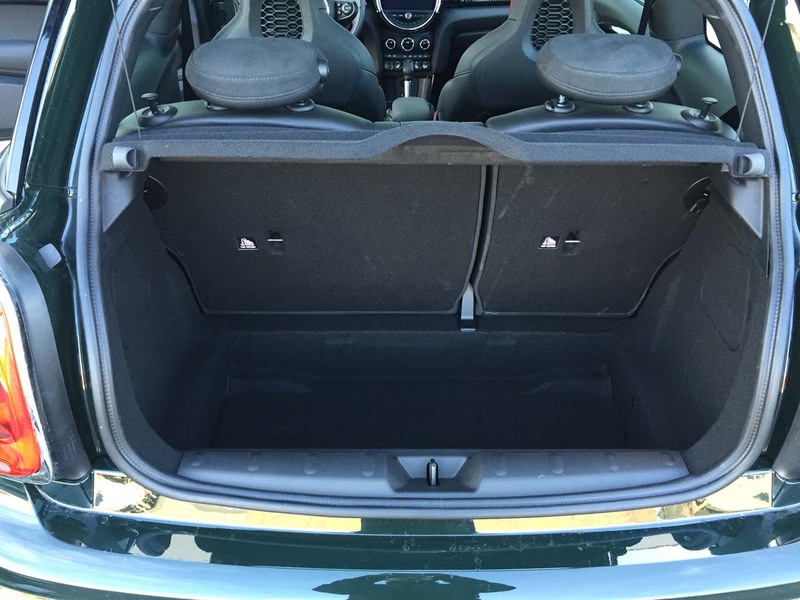 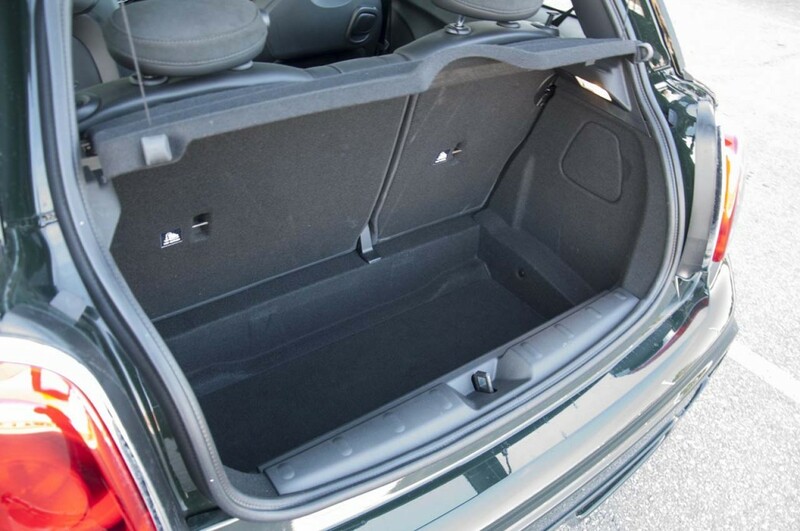 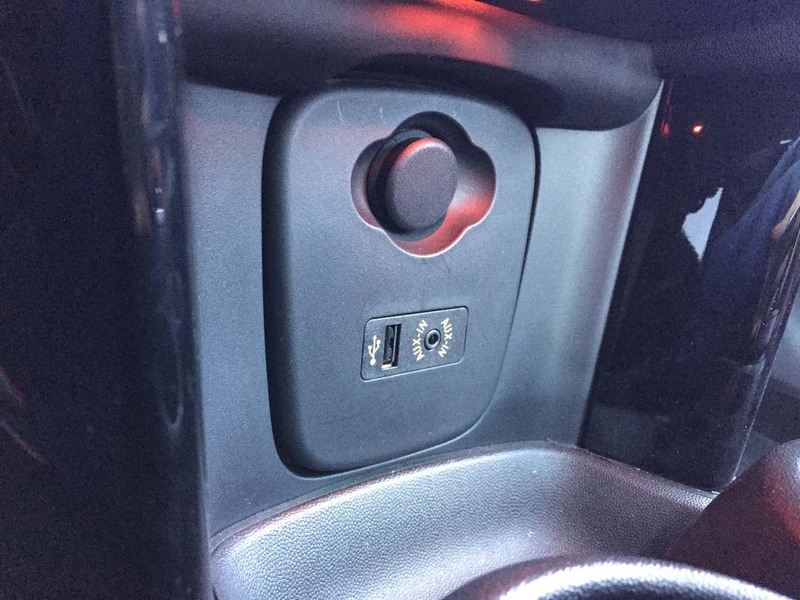 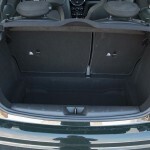 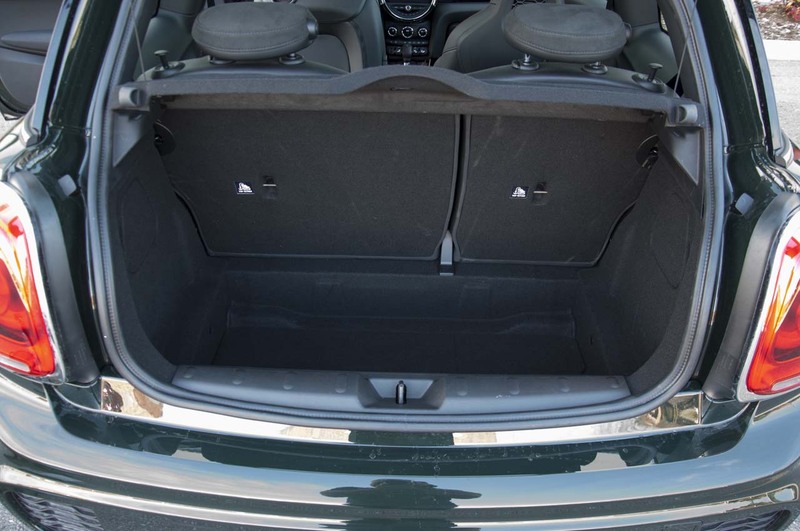 The back seats are almost unusable but they are there in case you need them and on a regular basis, they can act as additional storage since the trunk is pretty tiny too. 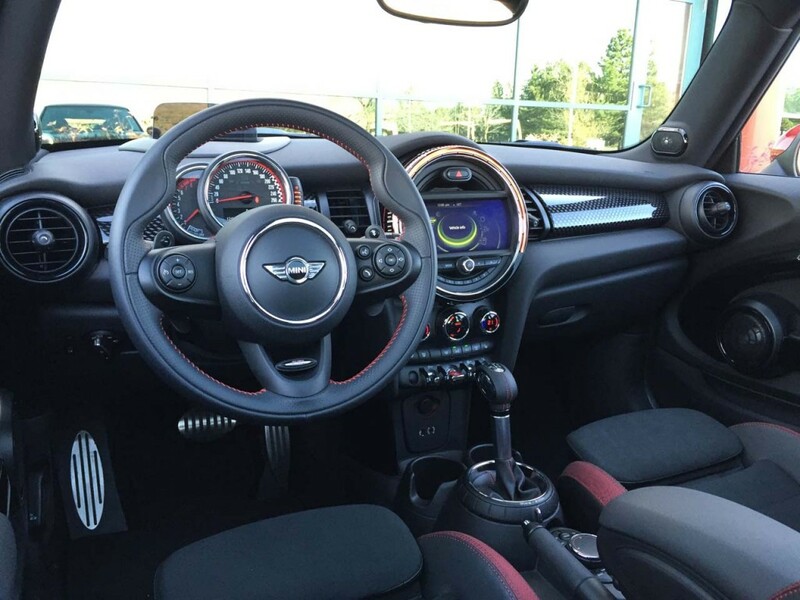 It is really cool inside, not to mention unique. 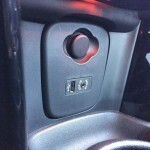 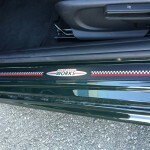 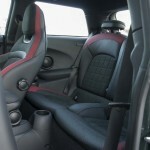 Lots of soft materials have been used and fit and finish are great, despite the complex design and multiple parts used. 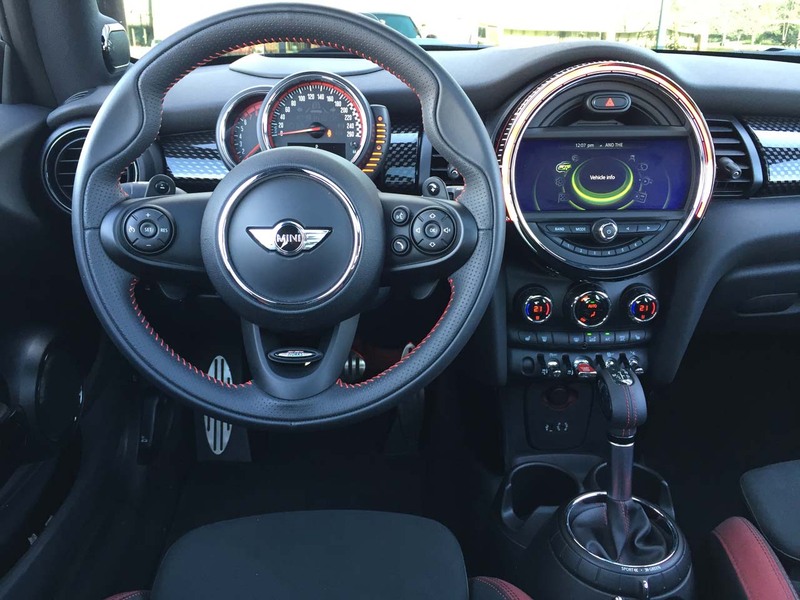 You can never forget what car you are in by looking at the dash, steering wheel, instrument cluster or any other little detail. 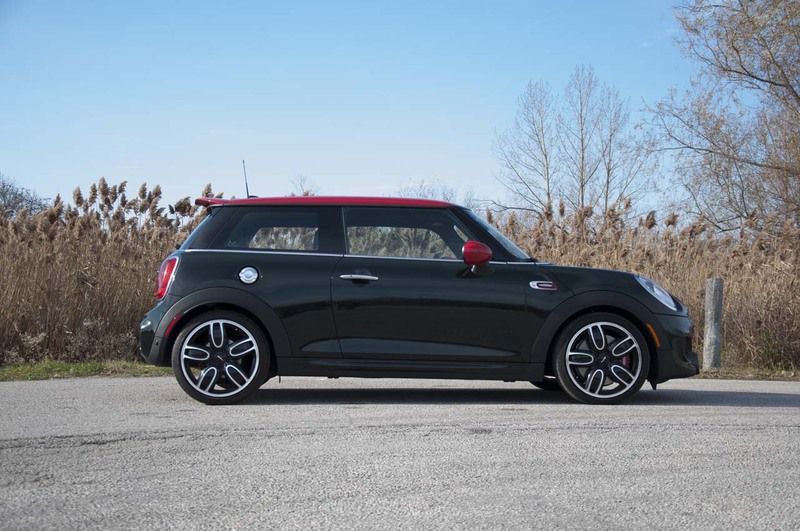 Everything is very “Mini”, except the price, which is kind of… maxi. 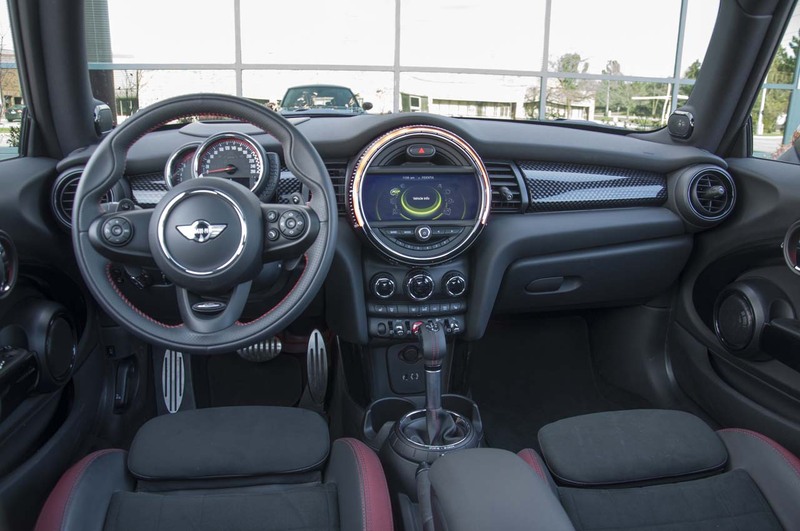 As tested, it costs CAD $44,740, which is $11,500 above the MSRP ($33,240), but before you say OMFG, here is a quick list of features you will be getting; brilliant suede heated bucket seats, the quick 6-speed sport automatic transmission with paddle shifters, 18” JCW alloy wheels, big Brembo front brakes, dynamic adaptive suspension, heads-up-display, navigation with a 6.5” color display, Bluetooth, aux/USB, double sunroof, keyless entry, auto lights and wipers, climate control, park distance control, a very good Harman Kardon sound system and an exhaust that makes a wicked snarling noise. 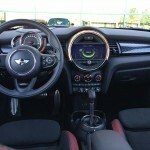 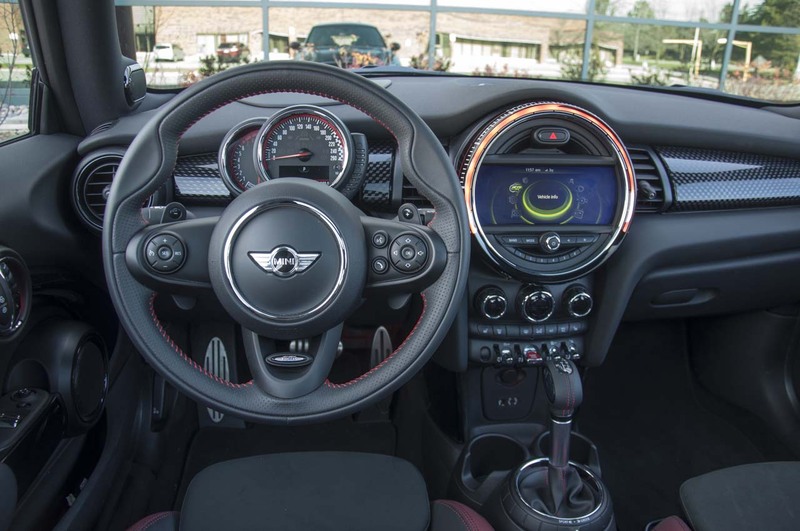 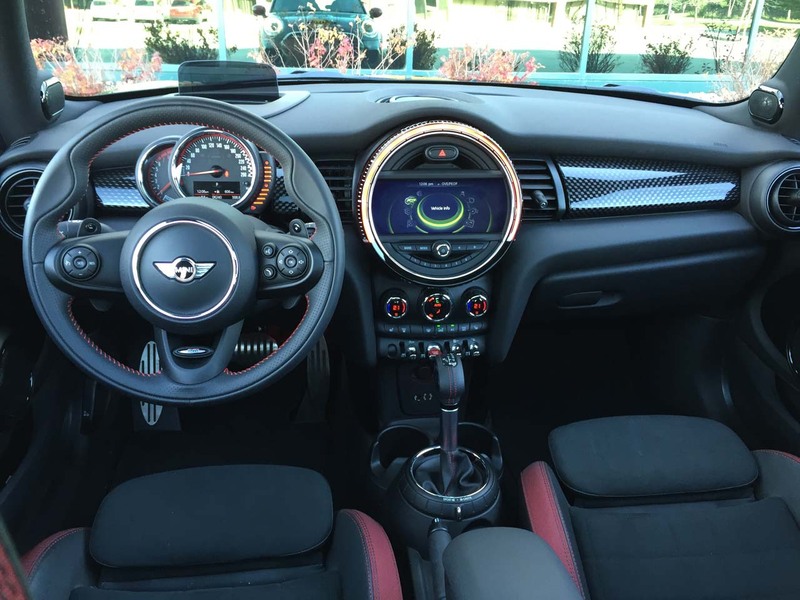 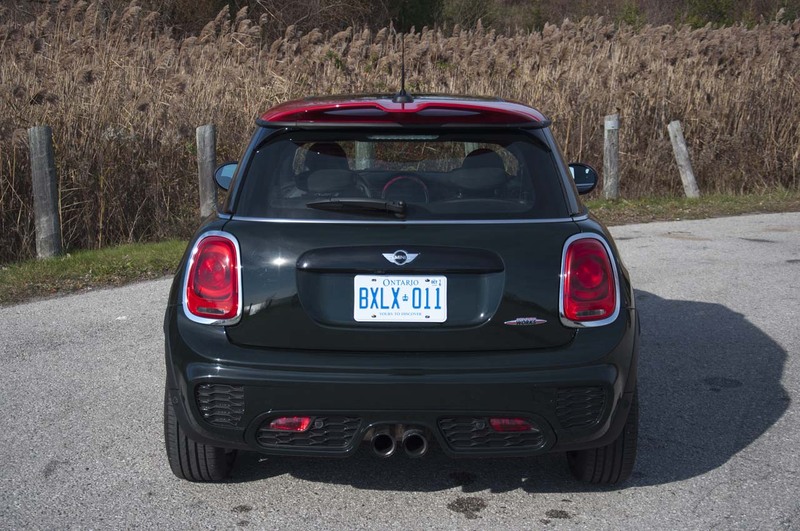 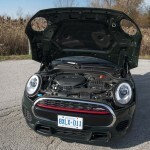 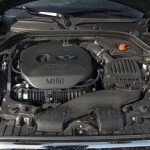 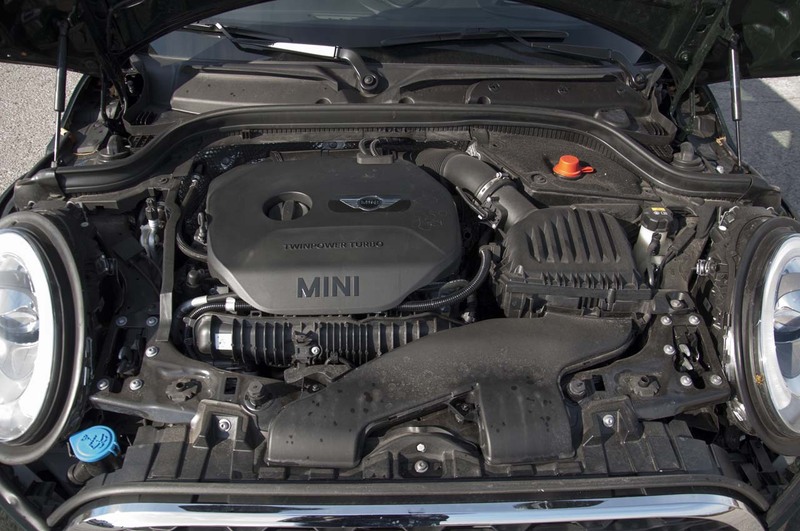 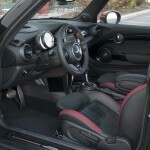 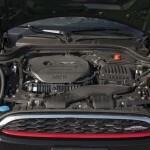 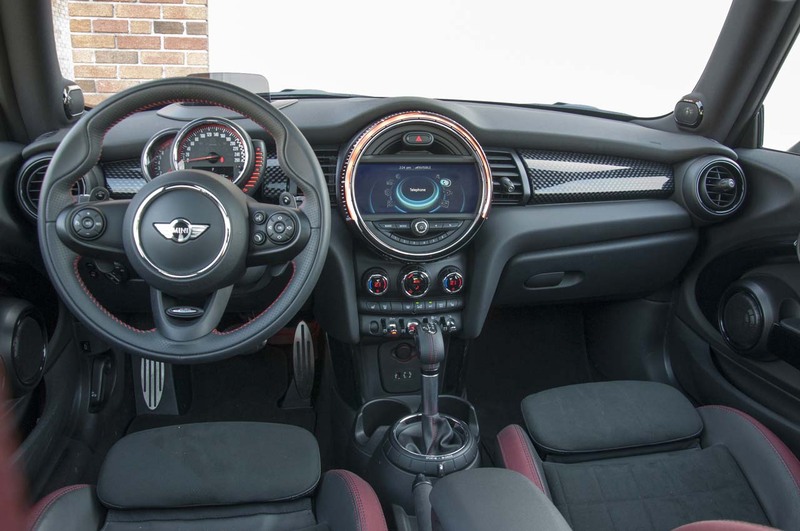 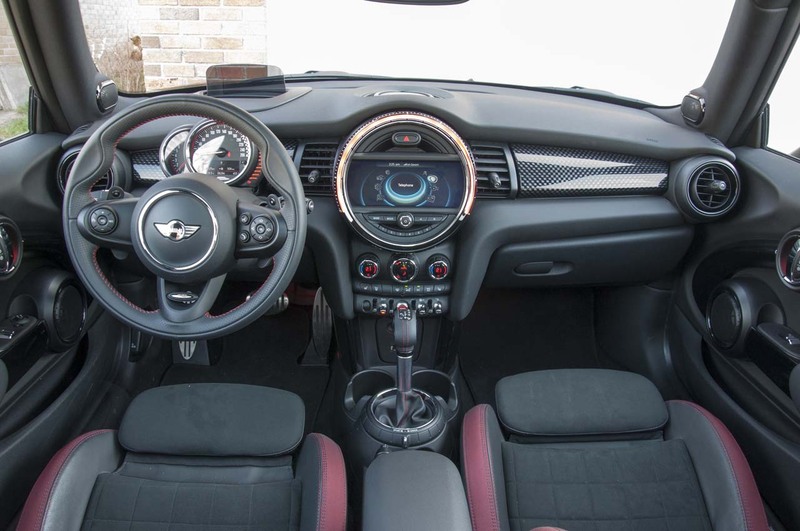 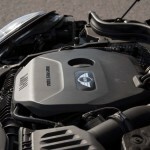 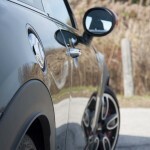 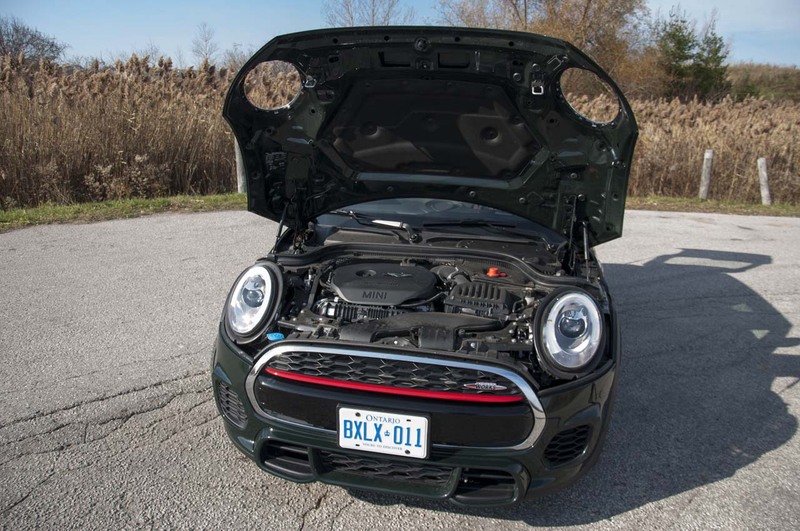 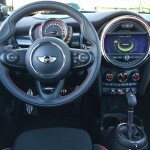 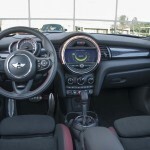 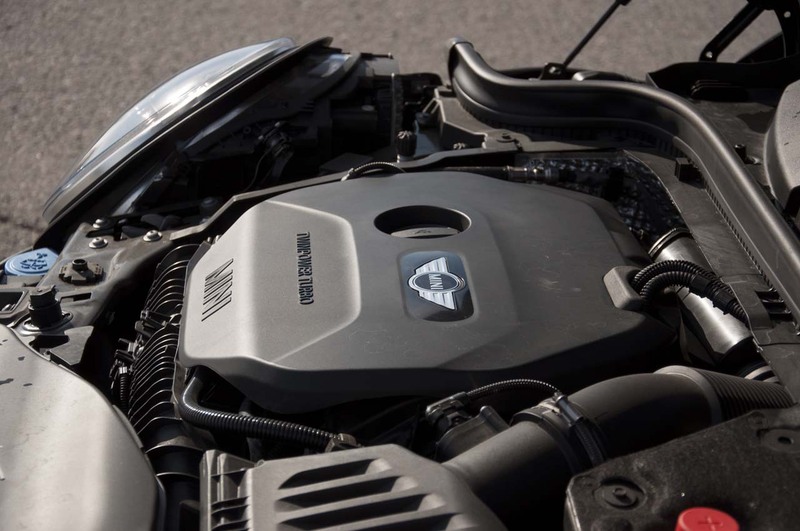 What makes the JCW so special, other than the visual cues, is the tuned engine under the tiny hood. 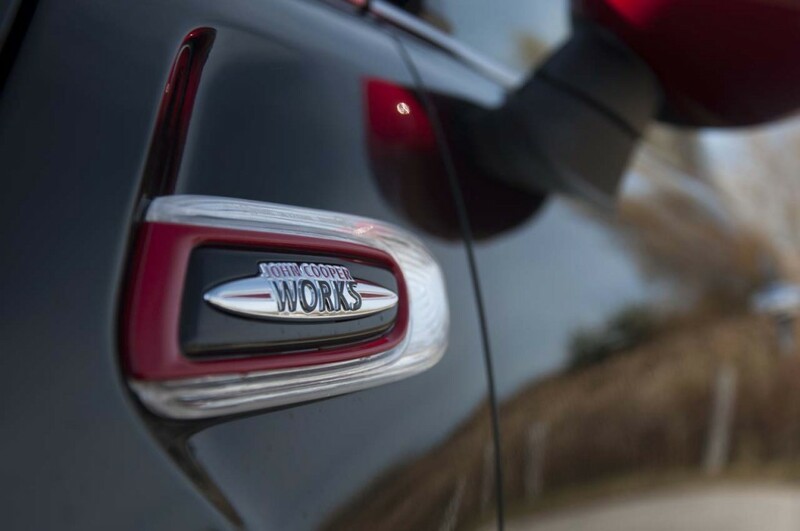 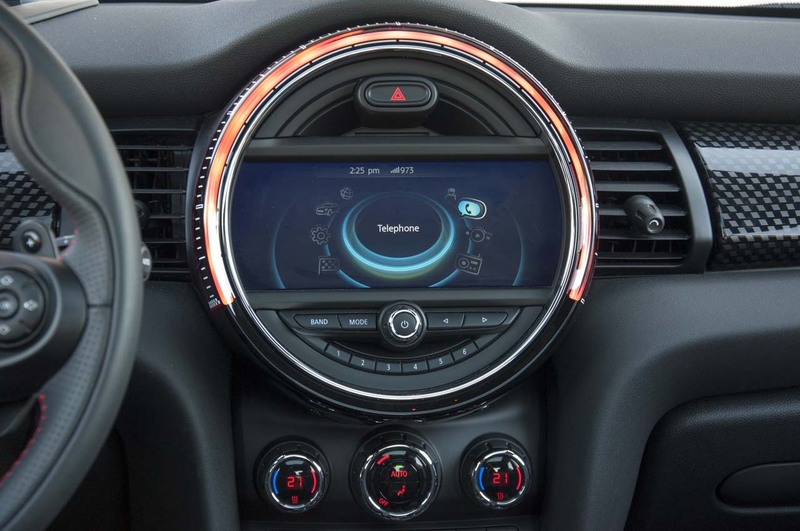 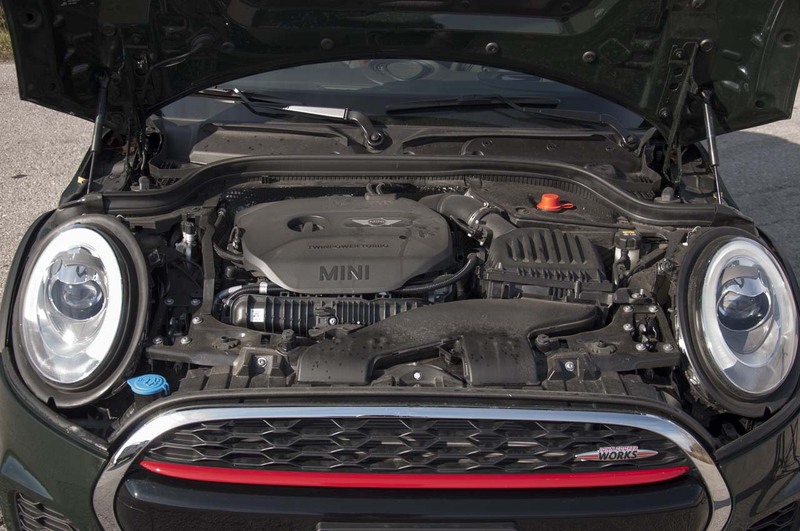 For the occasion, the 2.0L turbocharged 4-cylinder makes 228 HP and 236 lb-ft of torque and needless to say, it is the most powerful production Mini to date. 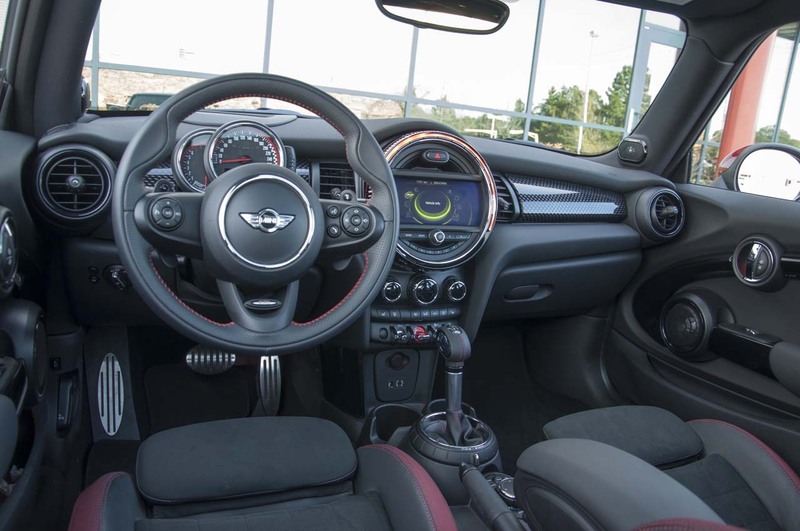 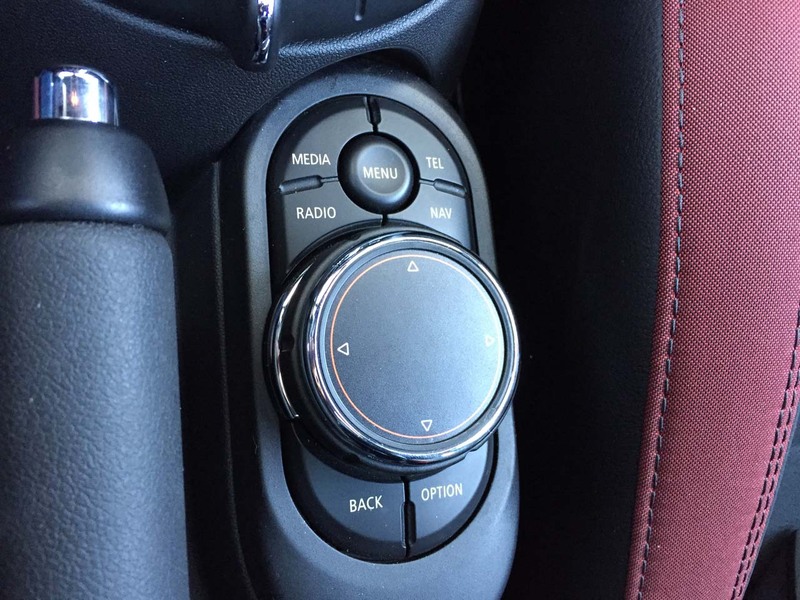 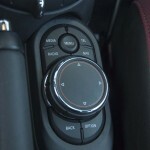 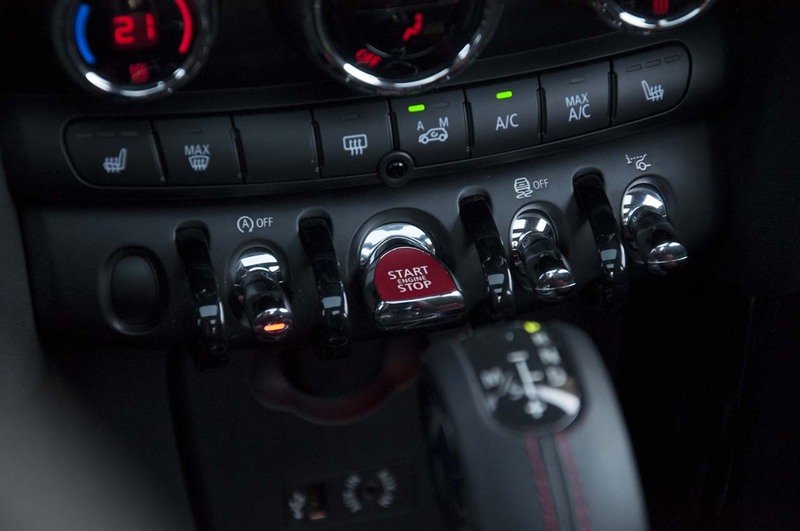 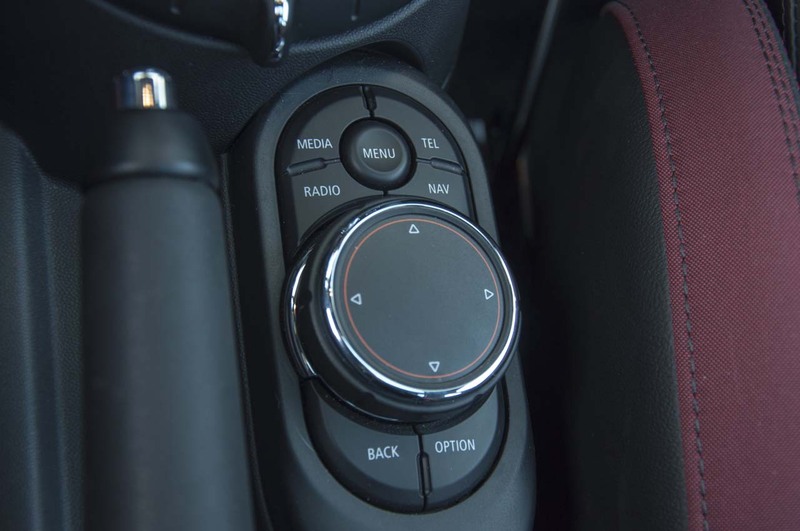 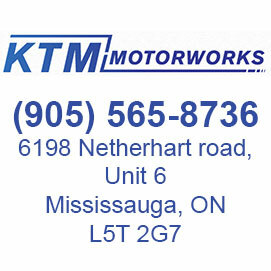 Engage the launch control that is available when the car is equipped with the automatic transmission and the sprint to 100km/h takes as little as 6.4 seconds. 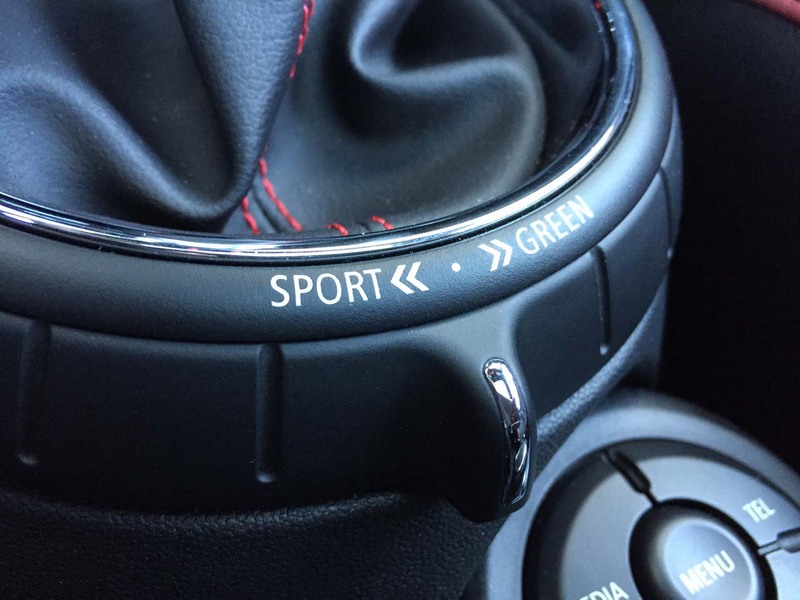 Throttle response is immediate in Sport mode, pretty good in Mid and very laid back in Green and that concludes the three modes available. 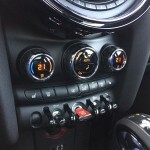 Performance is always really good, and this Mini pulls from low revs with elasticity you wouldn’t believe. 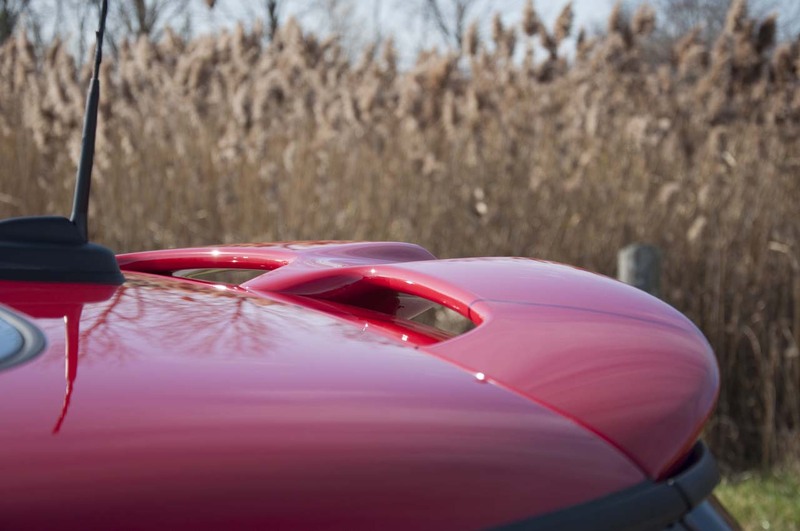 The impressive thing is how you drive this rocket with its torque, cause unless you take over, it shifts really early but at the same time speed increases very rapidly. 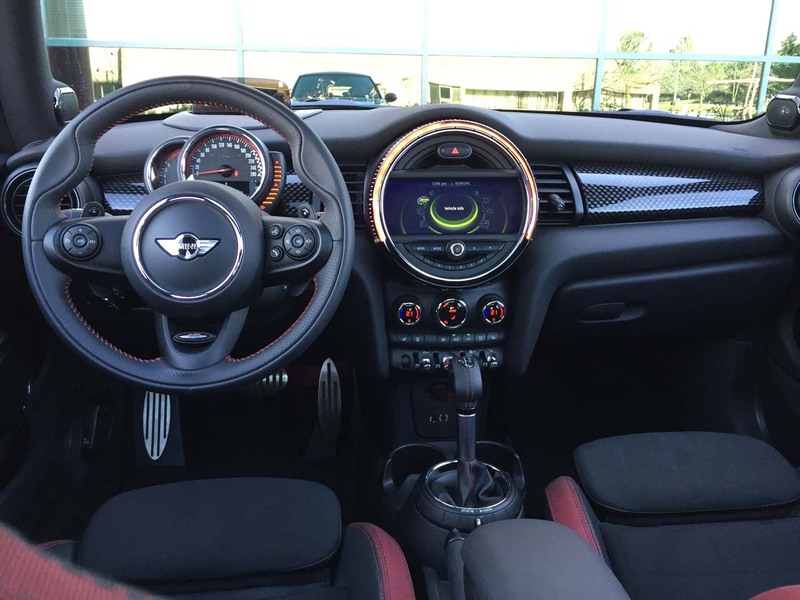 Before you know it you might be way above the speed limit, so watch out. 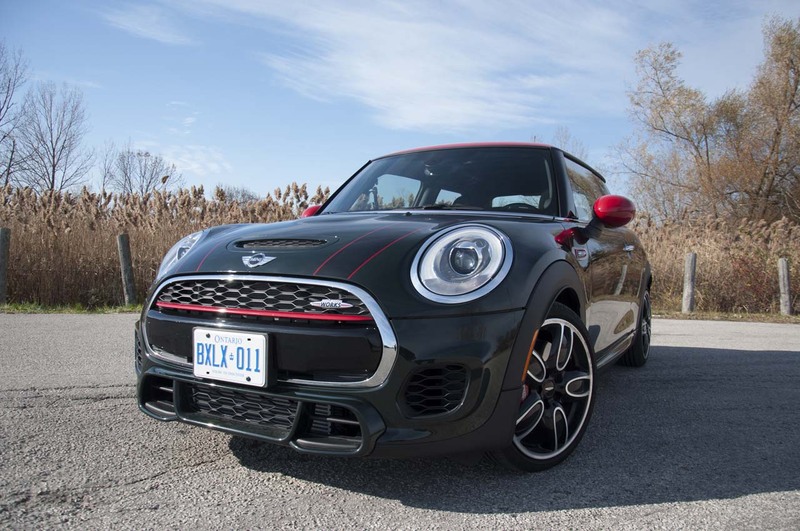 Fuel economy is impressive to say the least, as after a week of dropping fuel into the exhaust to please our ears, the average was still just 8.3 lt/100km. 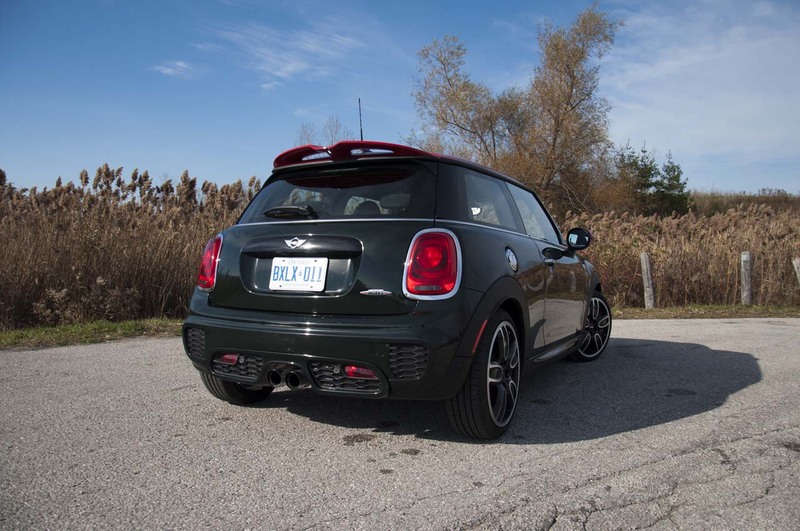 The exhaust snarls and sounds feisty, so when you are driving down twisty roads, you will catch yourself shifting just for fun. 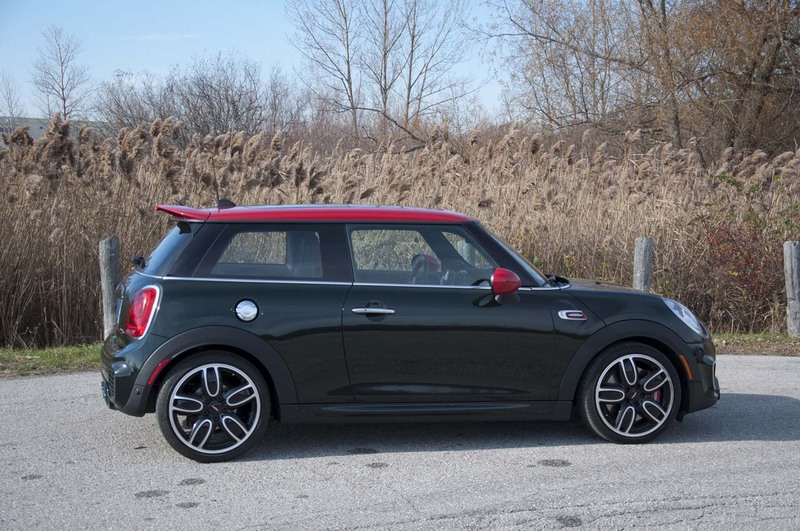 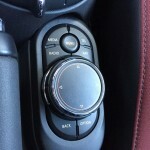 If you pick the manual one, it will rev-match for you, making it even more fun. 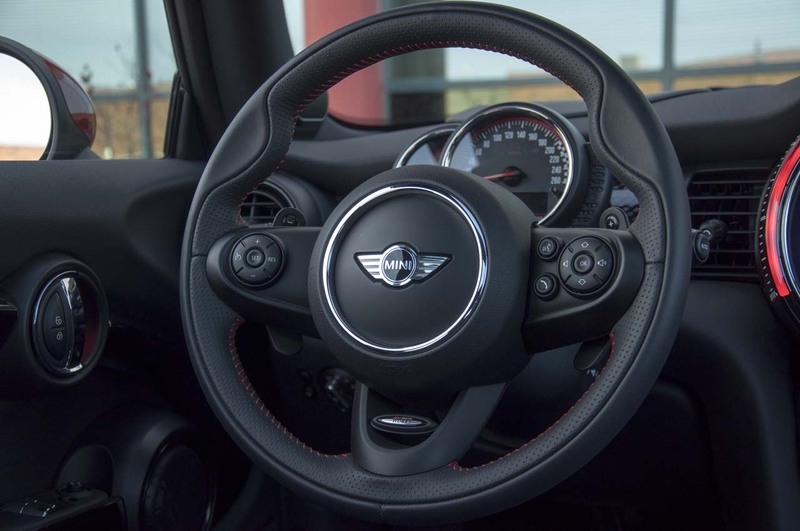 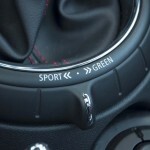 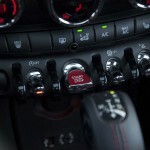 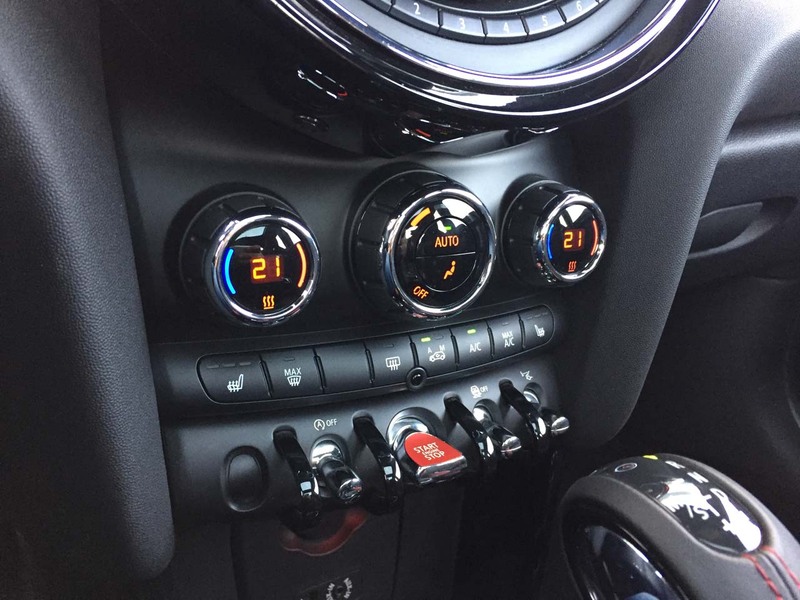 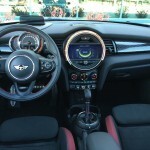 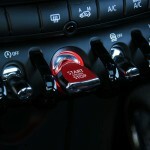 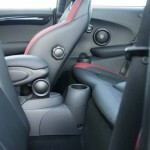 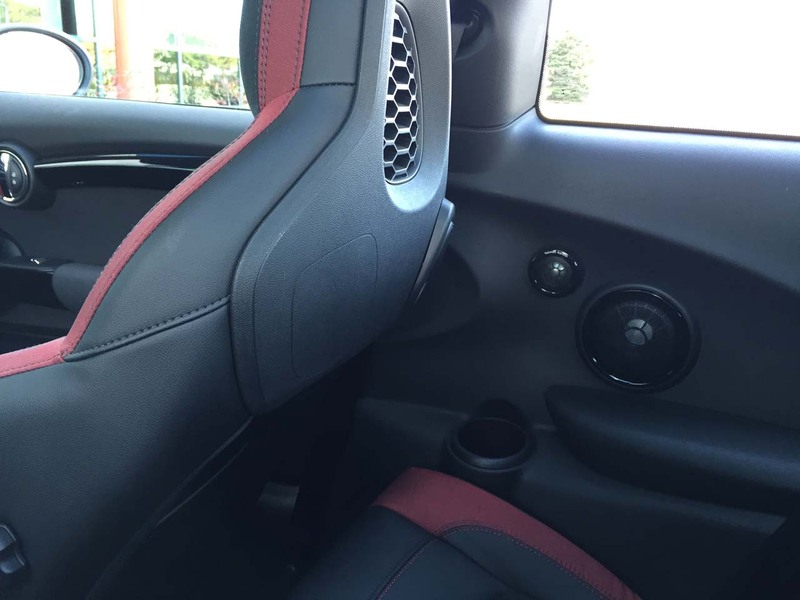 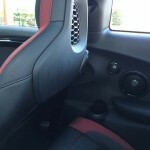 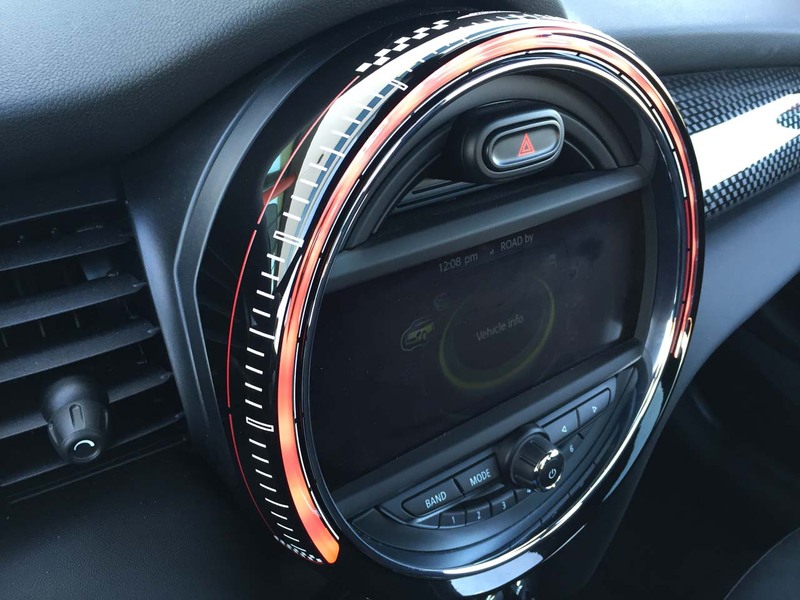 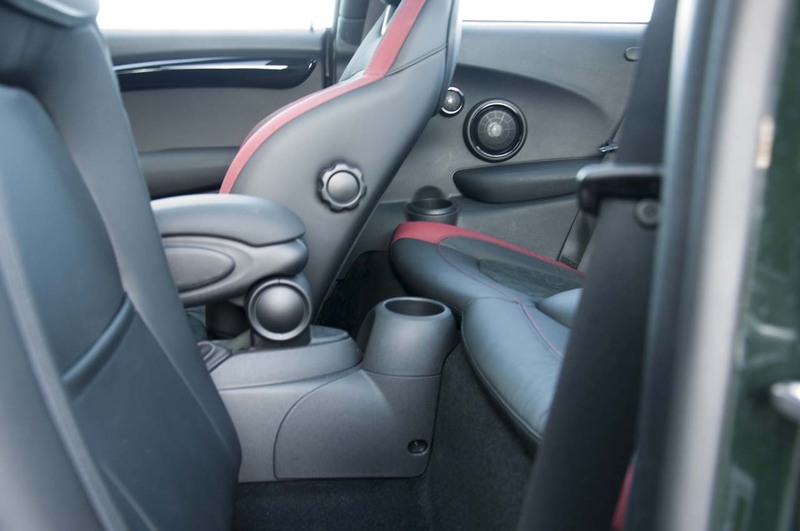 The JCW feels glued to the road and there is no torque steer at all, even under maximum acceleration. 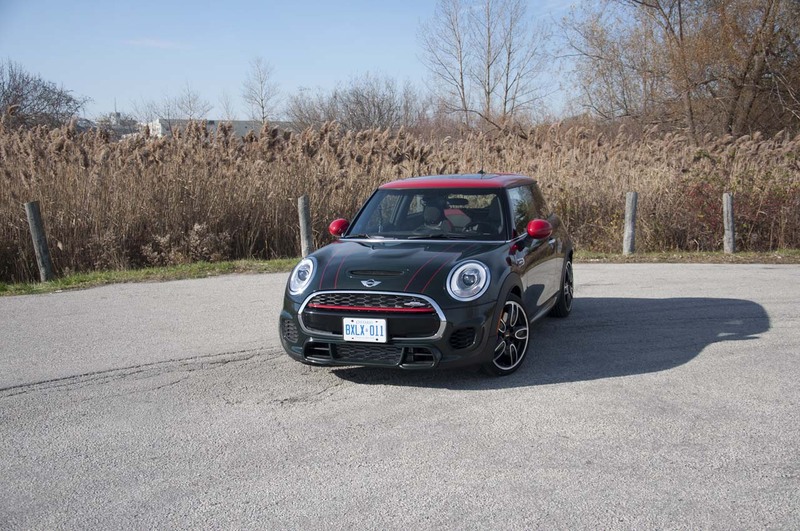 Through corners, it puts up a very good fight against understeer and the sporty steering communicates the how well that fight is going, real time. 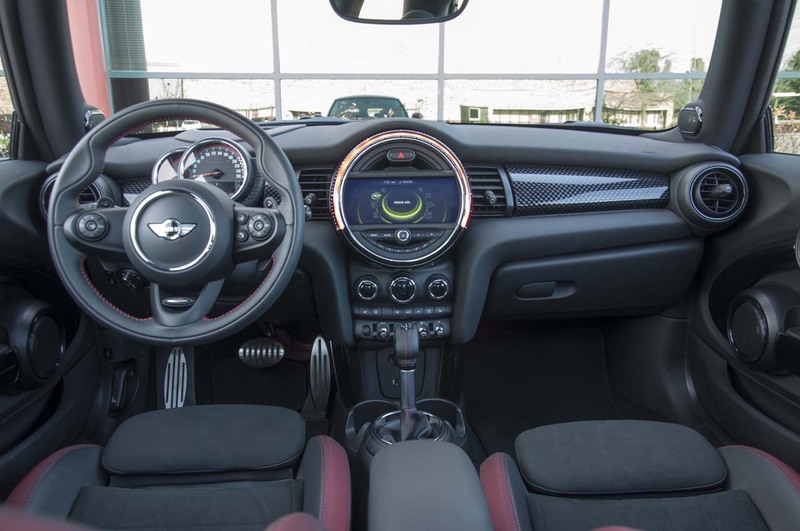 It corners almost flat and even at very high speeds it will not scare the driver, as it is very progressive and predictable. 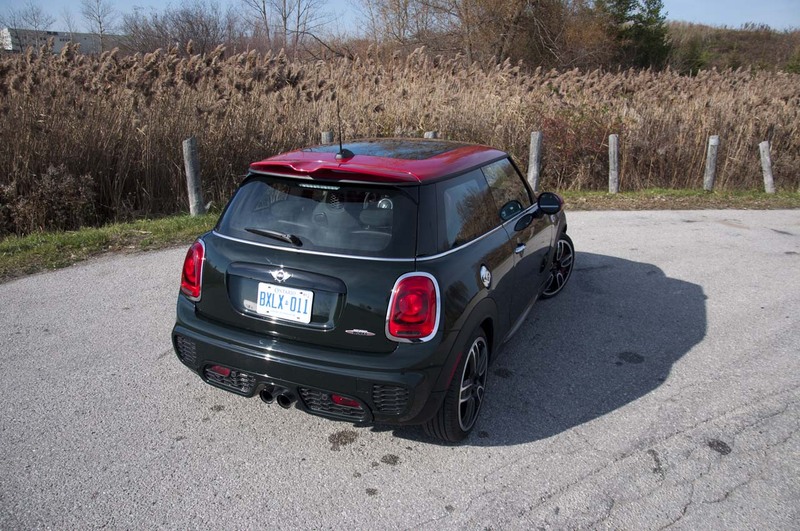 Lift-off oversteer is just too much fun in this go-kart like toy. 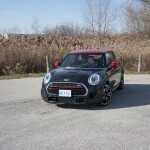 On the track, it feels as agile as you’d expect it to be, but impressively, it is quite fast too. 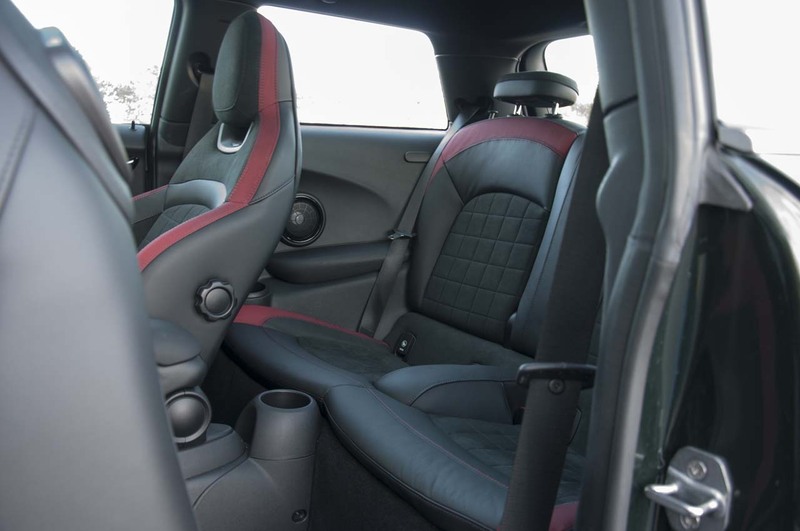 So if track days are something regularly found in your calendar, this JCW will not disappoint. 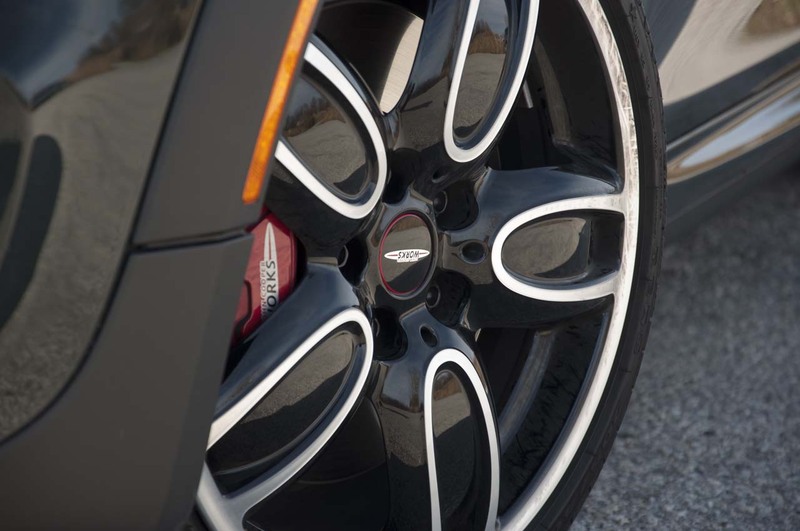 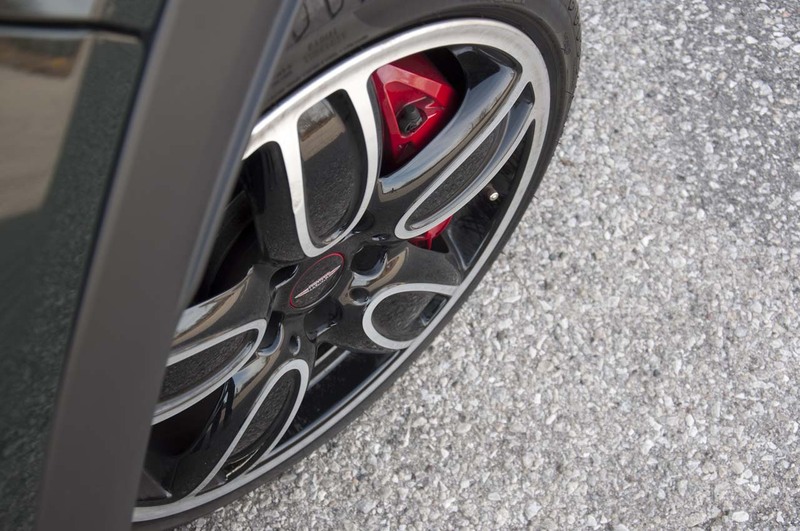 Even the brakes are up to the job, stopping it in 41m from 100km/h. 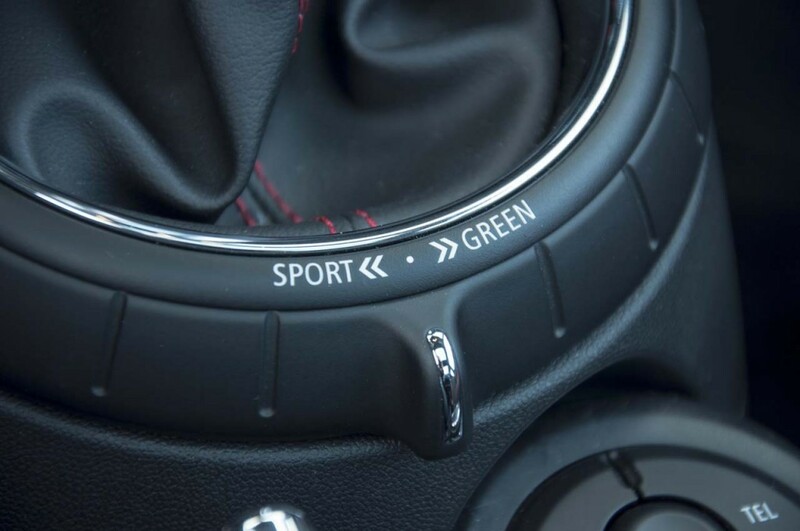 Ride comfort is acceptable, especially in Green and Mid mode when fitted with the dynamic adaptive suspension, it is soft enough for a relaxed and fun daily commute. 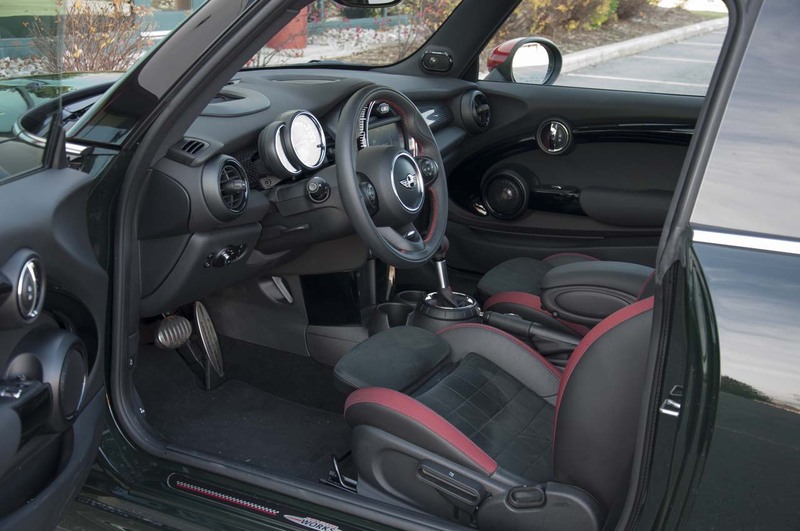 In Sport mode (and only if you set it like that) the suspension firms up about 10% and that is enough to notice the difference in both comfort and handling. 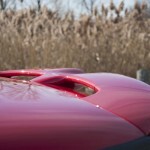 It is a very expensive toy, but you will really quickly realize why. 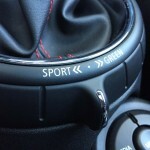 It is build to excite, to involve and to affect your daily life in a good way. 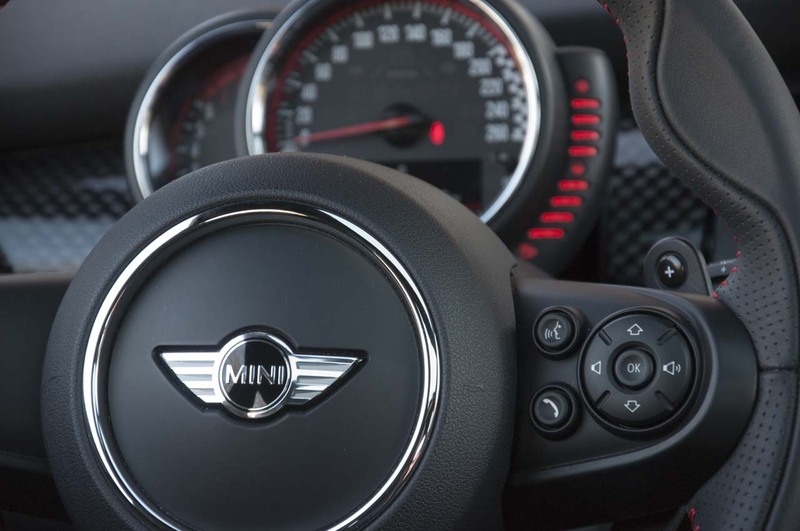 It will turn you into a Mini fan, it will force you regularly search for accessories for it, and most importantly, it will become part of who you are. 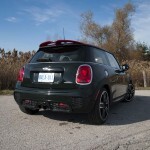 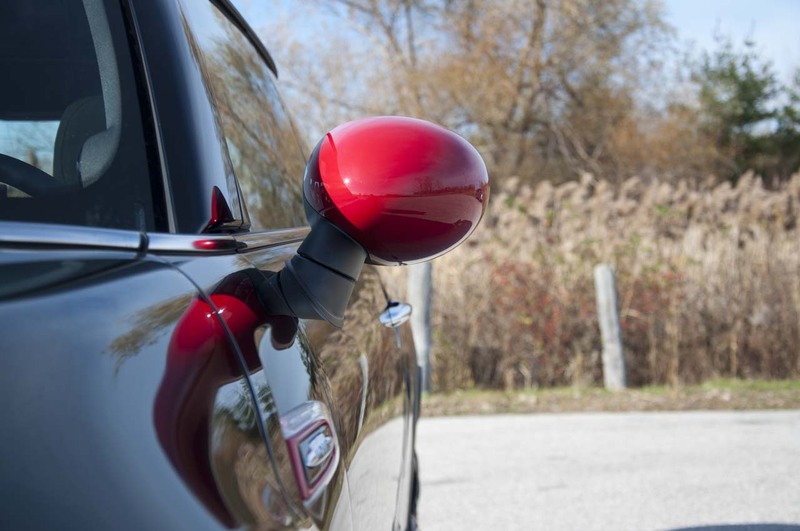 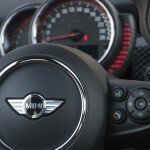 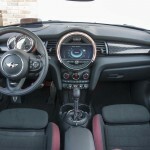 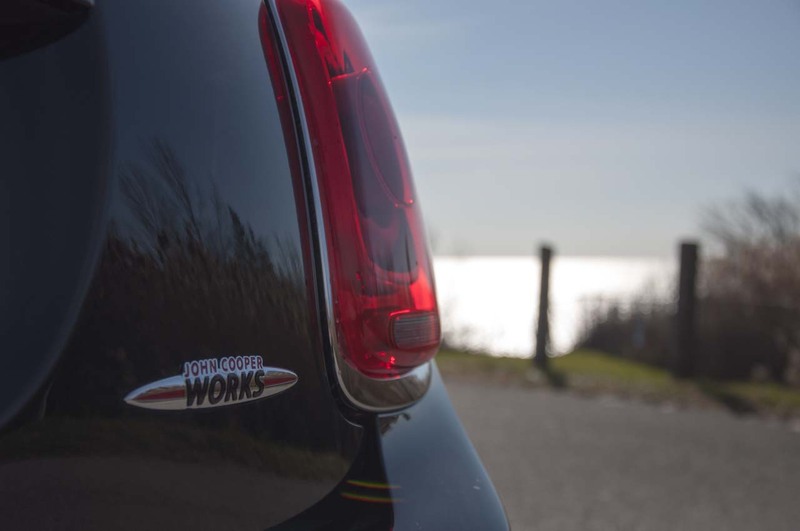 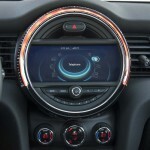 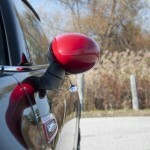 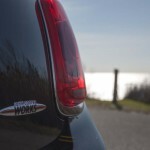 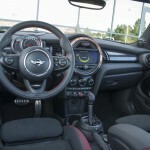 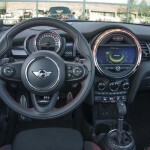 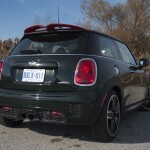 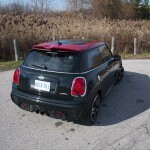 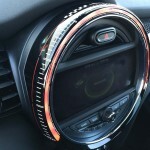 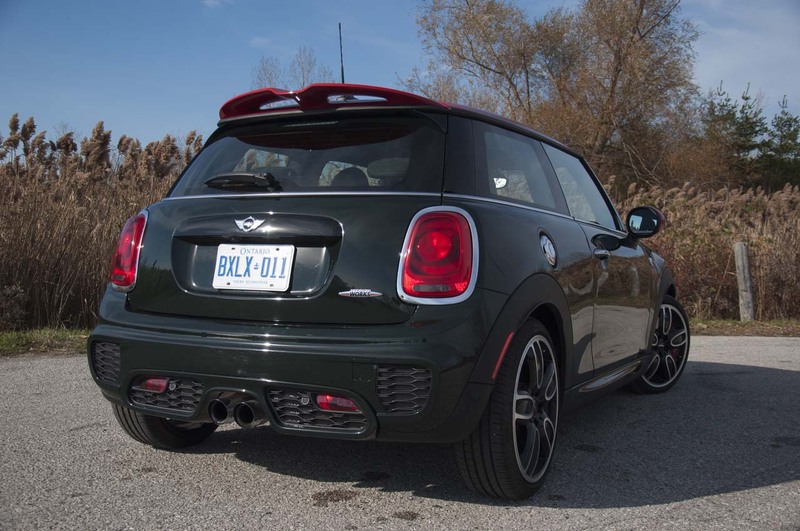 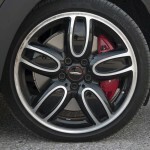 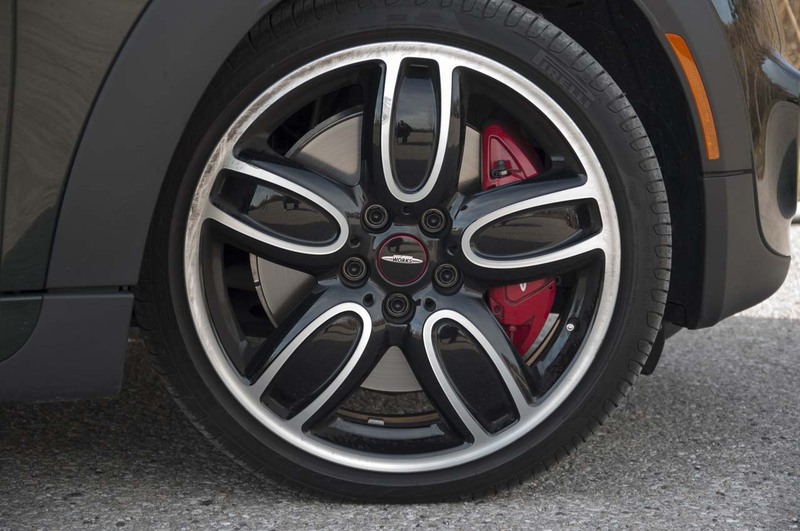 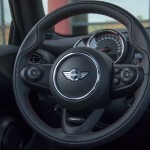 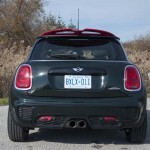 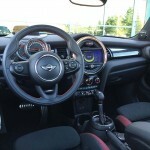 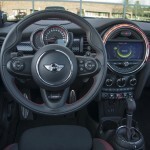 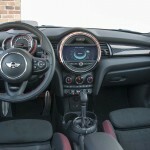 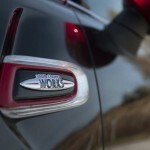 Fast, fun, cute and a serious little racer, the JCW is the most fun Mini made to date.